baking | A City girl gone Country. I love crumpets. Something about their holey texture that soaks up butter & honey is just magical. Mmmmmm mmmm! However crumpets, along with english muffins, remained in my mind for many years something I *had* to buy at the store, something I couldn’t make at home. Well, I was wrong about the english muffins (which I can now make at home) and I was wrong about crumpets! Carrot Cake is one of those cakes where for me the ingredients miraculously bind together, taste terrible in the bowl (who doesn’t lick the bowl!) and make a wonderful tasting cake after they’re baked. 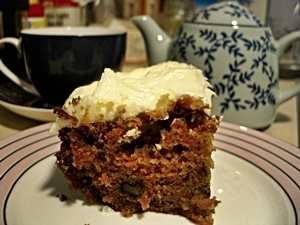 Obviously, this is the joy of baking, but for years, Carrot Cake was something other people baked and I did not. I have very fond memories of slabs of carrot cake, thick with cream cheese icing and juicy with lots of carrot and pineapple (apparently this is an Australian thing! ), being sold up the street at a fantastic food place whose owners were actually German. They made the best dark rye bread I’ve ever had the pleasure to taste (thick with sesame seeds on the outside and almost black in colour), an amazing black forest ham, and this carrot cake. Since then, and I’m talking up to 20 years ago now I guess, ever carrot cake has just paled in comparison. I’ve eaten some good ones, but that delicious moist cake remains vivid in my memory as the best carrot cake I’ve ever eaten. I first made carrot cake for my birthday back in 2007 (around the time I started this blog), and it was a partial disaster! It was a sheet cake and unbeknown to me, the oven in our flat actually sloped forward, and I ended up with a cake that was thin at one end, thick and the other, with half of it burned on the floor of the oven. It tasted pretty good, but wow – disaster. Definitely a LizziebeeFail! I was a bit horrified at the amount of oil and eggs in the cake, and thought I’d give it another go later. Which didn’t happen. In January, the lovely Afeitar posted a carrot cake that she made for her boyfriend’s birthday, taken from the Hummingbird Bakery recipe, and I thought the time has come: carrot cake is my partner’s favourite cake, and I decided to make it for his birthday this year. And it’s a good cake! I had to substitute a few things, just because I didn’t have them in my pantry when I started to put the cake together: like a blended vegetable oil (mostly canola with a little soyabean) instead of the Sunflower called for, and I had no cinnamon, so I upped the ginger and popped in some nutmeg. The cake itself is also huge. *laugh* There is only two of us, and there is a LOT of cake to eat! I have a feeling that I’ll be taking cake to work to share with everyone @ the bakery. 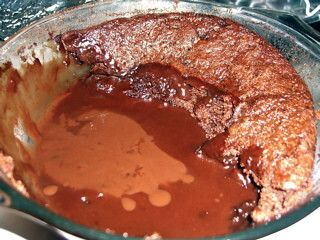 Put the sugar, eggs and oil in a freestanding electric mixer with a paddle attachment (or use a handheld electric whisk) and beat until all ingredients are well incorporated, slowly add the flour, bicarb, baking powder, cinnamon, ginger, salt and vanilla extract and continue to beat until well mixed. (If you don’t have either a freestanding mixer or a handheld, you can do what I did and just mix it by hand.) Stir in the grated carrots and walnuts by hand. For goodness sake, split the mix into two tins. I didn’t, and my cake took about 75 minutes to bake, and it’s a BIG cake. If you split it into two sheet cake tins, you can freeze an entire cake for later, or feed a lot of people. If you pop it into two bigger circle tins (and I’m thinking 10″ or more), you can make a double layered tin. Split into two, your cake should take around 35-40 mins to bake. Check it at 35: if it’s still wobbly, you’re looking at another 10-15 minutes. Take out when a skewer inserted comes out clean and cake is dark golden. Leave to cool in the tins for 5 minutes, and then turn out to cool. 100g unsalted butter at room temp. Beat the butter and 100gms of the icing sugar together by hand, or in a mixer, to start to incorporate the mix. Add half of the cream cheese and beat mixture in the mixer, or start to use a handheld mixer. Slowly add half of the icing sugar left (to make sure it doesn’t redecorate your kitchen in white), then the rest of the cream cheese, and finally the final icing sugar that remains. Beat until pale in colour and fluffy. You don’t want a heavy cream cheese icing. Spread over the cake thickly and evenly. If you’ve got two halves, you will have enough to cover the top, middle & sides. If you have one BIG cake, you will have frosting left over. (Like I do!) I would suggest halving the mix, or at least cutting it down. Sprinkle some walnuts over the top for a special look. Sundays mean scones to me. In my childhood, my Mum would often whip up a batch of fluffy scones for morning or afternoon tea on a Sunday, and they would be served hot, the batch wrapped up in a tea towel to stay that way, with whipped cream and jam. I learned how to make scones at my Mum’s side, so it’s been one of the recipes that I’ve always understood how it works, and how to put it together. I’ve never managed to have a flat, hard rock instead of a scone (instead of that one time that I put in plain flour and forgot the baking powder required to make it self-raising, but this is the last time that I shall mention this!). To me, a scone is made with flour & butter & milk, not flour and lemonade and something else. It puzzles me that there are recipes that include a fizzy liquid, however I can understand them. I’ve had family members that couldn’t make a scone to save their life, and their results are hard enough to bounce off the floor and stay in one piece. The feathery texture of scones are reliant on rubbing the butter in to the flour well, and not over-mixing or kneading the dough. However, it’s not a disaster if you do – simply let the mixture sit for a while. Wrap it in plastic and pop it into the fridge, then let it come back to room temperature after 15 minutes or so. It’s also a recipe that you perfect if you make it often enough. You wont need a recipe for them. My Mum doesn’t need her recipe for them, and whilst my recipe is very water stained and flour covered, I now am almost at the stage of not needing the recipe either. And I am definitely AT the stage of knowing the mixture well enough – how it mixes, and comes together – to know how to add things. In fact, my excels-at-scone-making Mum now calls me for my Spinach & Cheese Scone recipe! For a recent themed competition on another site, I produced these scones. The theme was cheese, and as soon as I saw it, I thought “Ooooh what an excuse to make cheesey scones! !” And they’re so good. By themselves spread with butter than melts when they’re still warm from the oven, or slightly toasted and eaten with soup the next day, you can’t go past Cheese and Chive Scones! They’ve got to be my foremost default cookie. I try and have the ingredients on hand at all times, and it’s not that hard to do. Of course, looking in my cupboard and fridge right at the moment, before I’ve done shopping for the week, I’ve hardly got any of the ingredients! Chocolate chips? Nope. Butter? Zilch. Flour?? Get outta here. But I know it can be easily remedied. Now that the weather has turned towards winter, and the days are colder, the nights longer, my cookie jar calls out to be filled! At the moment? It’s got sultana & oat biscuits in it. These cookies are made from the same basic recipe that my chocolate chip ones come from. So, in regards to the recipe that I’m going to write up today, there are many variations, all depending on your own likes and dislikes. But seriously – who couldn’t love these cookies? Beautiful, golden brown, crispy cookies. YUM. Eaten whilst still warm out of the oven, is sheer decadence. I love finding new biscuit (and for you Americans, that’d be cookies, not breakfast biscuits) recipes. We’ve all got out favourites: chocolate chip, Anzacs, oatmeal & raisin. 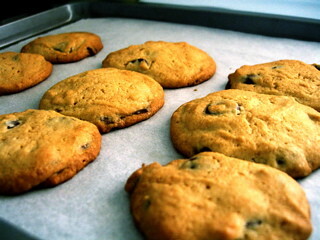 I have a great recipe by Bill Granger which is Peanut Butter Chocolate Chip. Just by substituting some of the butter in the recipe with peanut butter, it lends a lovely sweet nutty flavour to the biscuit. I also love the traditional Anzac biscuit, which is something that has so many different recipes, but all come from the same basic ingredients. Some have equal amounts of coconut, flour, sugar & oats, others have different amounts of each. Quite often, I go searching for recipes to replace store-bought biscuits: Tim-Tams (that great Australian chocolate biscuit), Mint Slices, Granitas, Gingernuts, Arrowroot. (All Arnott biscuits available in Australia.) 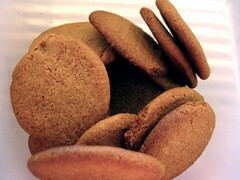 Today, I bring you Gingernuts! This is SUCH an easy recipe, I couldn’t get over it the first time I tried it. I seem to say that about all of the recipes that I’ve posted about, but again it’s true! And again, it’s an Egg-Free recipe! Don’t they look awesome? 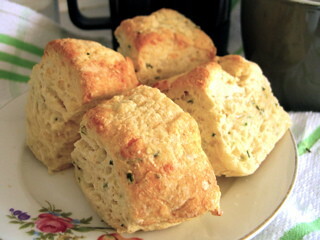 Crisp, light, wonderfully gingery, and great to have with a cup of tea or coffee, they’re great every-day biscuits. I can’t remember how I found this site – I think I was browsing through seriouseats.com one afternoon – but am I glad I did. Apartment Therapy’s The Kitchn presented a different idea from The Bread of last year – the No-Knead Bread – with their idea of No-Time Bread. Instead of throwing everything in a pot and leaving it for 24 hours before cooking it, this bread only takes 1 hour before it’s done. What? I hear you say. Bread from scratch in an hour? Not Possible! You’re pulling our legs. No, No! I profess – I promise you here and now. 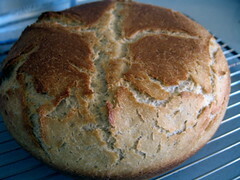 Fantastic bread, with a great crumb and even better crust, in only ONE hour! So, if you are craving that fresh bread feeling, but don’t have the time to set your bread maker, or indeed want the bread today instead of tomorrow, then is this the recipe for you! Yes, you too can produce this sort of good-lookin’ loaf this evening!